tourist destinations including the Space Needle, Pike Place Market and the Convention Center. 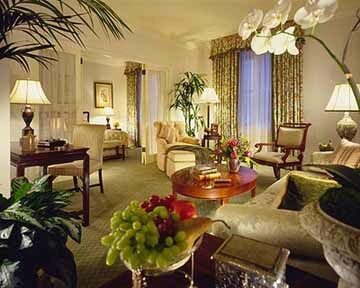 For travelers who prefer luxurious accommodations without the stuffiness, The Fairmont Olympic is the ideal place to stay when visiting Seattle whether it is for business or leisure. The hotel is the only AAA Five-Diamond rated hotel in the state and has been for over a decade. measure 350 square feet and offer an inside courtyard view. 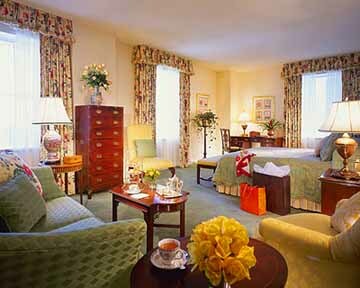 These rooms feature a small sitting area with a working desk and offer either two twin beds or one king-size bed. The Deluxe Rooms offer 450 square feet and are furnished with either one king-size bed or two twin beds. Guests will enjoy a spectacular view of the city as well as a partial view of Elliot Bay. These rooms also have a sitting area with an overstuffed armchair and ottoman as well as a working desk. picture windows. The dining area can accommodate up to 12 guests. The marble bath features a luxurious jetted tub. The Olympic Suite is located on the top floor of the hotel. This suite can be converted from a one-bedroom suite to a two or three bedroom suite. line. Computers and fax machines are available upon request and it is simple to keep in touch with the outside world via high-speed e-mail and High-Speed Internet access. Other in-room amenities include fully stocked bar/refrigerator, hairdryer, radio alarm clock, modem phone jack, speaker phone and voice mail. Baby cribs are available and hotel staff will gladly child-proof rooms. Handicap accessible and non- smoking rooms are available upon request. 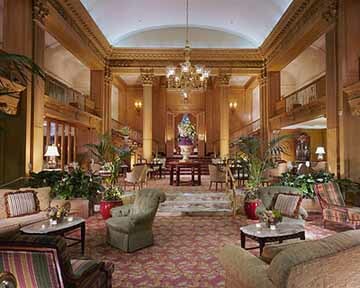 The guest services offered at The Fairmont Olympic Hotel Seattle will leave guests feeling relaxed and pampered. Exercise enthusiasts will be pleased to discover that they need not stray from their workout routine just because they are away from home. 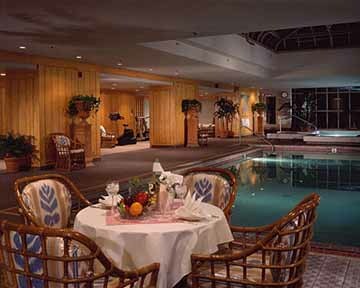 The hotel houses a full service health club that is equipped with everything from cardio machines to free-weights. After a hard workout, guests can cool down with some delicious juice and enjoy a mind melting massage. A wide array of spa treatments is available at the Jeremy Todd Wellness Spa & Salon which is located on the arcade level of the hotel. For those who prefer to have a massage in the privacy of their own room, no need to worry, this too can be arranged. The hotel concierge is available around the clock to assist guests with anything they might need. This ranges from securing dinner reservations at any of Seattle's delicious dining establishments to pointing travelers in the right direction of all of the city's hidden gems. Mom and dad can enjoy a romantic night out on the town and be assured that their children are in safe hands as the hotel provides babysitting services. Other guest services include express check-in/out, overnight laundry dry cleaning, umbrellas, valet parking, twice-daily housekeeping, around the clock room service, complimentary overnight shoeshine, complimentary children's services/amenities, one-hour pressing, hotel/airport transfers and on-site parking. Business travelers also enjoy a wide array of business services including complimentary newspaper with breakfast, cellular phone rentals, pager rentals, airline ticketing services, audiovisual equipment, translation services and secretarial services. Business guests also have access to fax, copying, postage and delivery services 24 hours a day. Guests need not even leave the property in order to enjoy a delicious meal as The Fairmont Olympic Hotel Seattle is home to four restaurants. The Terrace is infamous for its mouthwatering martinis, but they also serve delicious hors d'oeuvres and rich coffees. The Garden has also been recognized for their martinis. This is a great place to pass an evening in Seattle while enjoying spectacular live jazz in a beautiful setting. Shuckers is one of Seattle's most popular oyster bars. This is a wonderful spot to sample some local brewed beer. The Georgian features a wine list that is sure to please even the most discerning palates and the food is prepared with a Northwestern flare.